Dedicated to Myriam, my best friend. My mother. This armchair represents maternity. We can see in the outlines of the upholstry, a woman carrying a child, an embryo, the world, perhaps, in a very protective position. It invites role playing, the kind that often occurs between parents and children. We can sometimes be the child, being carried by the softness of the fabric, and the comfort of the seat, but we can also be the parent seating in a comfortable breast-feeding armchair. 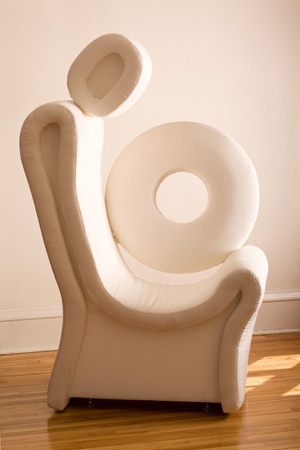 A sculptural armchair.